Hydro excavation is the innovative process of removing soil with pressurized water, and then using a vacuum air conveyance to transfer the soil to a debris tank. This non-destructive way to excavate soil can quickly uncover buried natural gas, petroleum pipelines, and water mains, while greatly reducing the risk of damage that can result from traditional mechanical digging. Locate utilities with the power of high pressure water and air movement, to safely expose all of the buried utilities at your dig site and continue your project with the peace of mind that you won’t be left with an expensive clean up bill or injured workers. Dawson Infrastructure Solutions sells, rents and services a comprehensive range of vacuum excavators to safely locate and excavate pipelines, fiber optic lines, cables, and other utilities. We’re a factory authorized distributor for the Ramvac and RamAir lines from Sewer Equipment Company of America. Tackle your toughest and most challenging jobs while still providing safe, damage-free excavation with truck-mounted hydro excavators. Dawson offers the full line of truck mounted hydro excavators from Ramvac, most notably the industry leading HX-6 Mid Size Hydro Excavator and the bigger HX-12 and HX-15. Rest assured that RAMVAC manufactures the most productive, highest quality, and best value machines available. The world’s first mid-size hydro excavator, the HX-6, combines the productivity of a large hydro excavator with the maneuverability of a single axle 39,000 pound chassis. The HX-6 is designed to work as productively as the large hydro excavation trucks – and in places they can’t. Work in alleyways, off-road, and all of those hard to get to locations while getting fuel economy that puts the bigger machines to shame. The HX-6 makes the perfect solution for municipalities, utility companies, and hydro excavation contractors. This model is also available with a RamAir air excavation system for when you can’t risk adding water to the problem area. With larger capacity and great features, the HX-12 and HX-15 bring all of the great Ramvac advantages to you in a larger capacity hydro excavator. The HX-12 and HX-15 feature a 12-yard or 15-yard debris tank respectively for when you can’t leave a big job to unload the material. These models features the industry’s only temperature controlled environmental chamber and a directional discharge system so you can off load your debris back into the excavation site when you are done – without the mess of dumping your tank. Ramvac understands that operators need a truck that can be repaired in the field quickly with parts that are locally available. The trucks in the HX series are made with easily understood electrical systems and do not rely on complex digital systems. These models are also available with a RamAir air excavation system for when you can’t risk adding water to the problem area. 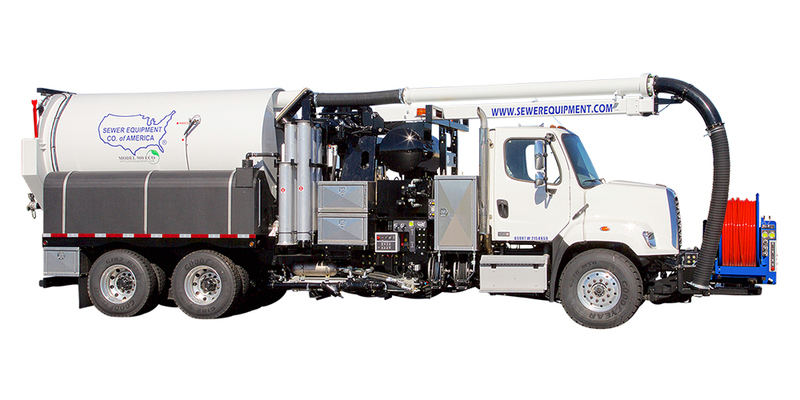 Contact Dawson today to configure the truck mounted hydro excavation system that works best for you. Combination sewer cleaners combine high-pressure water jetting with a high-flow vacuum source to scour pipes clean, then vacuum up the material responsible for blockages, to easily restore & maintain normal sewer flow. Dawson offers the Ramvac lineup of combination sewer cleaners to give you all of the versatility and durability you need in a sewer machine. You can jet sewer lines, vacuum catch basins, clean lift stations and perform many other jobs from a platform that’s designed for a hard days work. You will appreciate the quality components built into the Ramvac line; such as tubular steel framework, pre-painted sub-assemblies, top quality diesel engines, blowers, and pumps. You will find features like our 320° rotating extendable boom and the three stage cyclonic filtration that you would typically only find on a large truck mounted combination cleaner. Other features include a 3 yard debris tank, 600 gallon water tank, 1400 to 3000 CFM blower, 40 gpm @ 2000 psi water pump, plus a versatile rotating and extendable boom to rise to the challenge of any job. You can choose either a trailer mounted unit with an existing truck to pull it or our new hook lift combo unit so you can use your vehicle chassis for multiple roles. Contact Dawson today to configure a combination sewer cleaner that will save you money and get the job done. 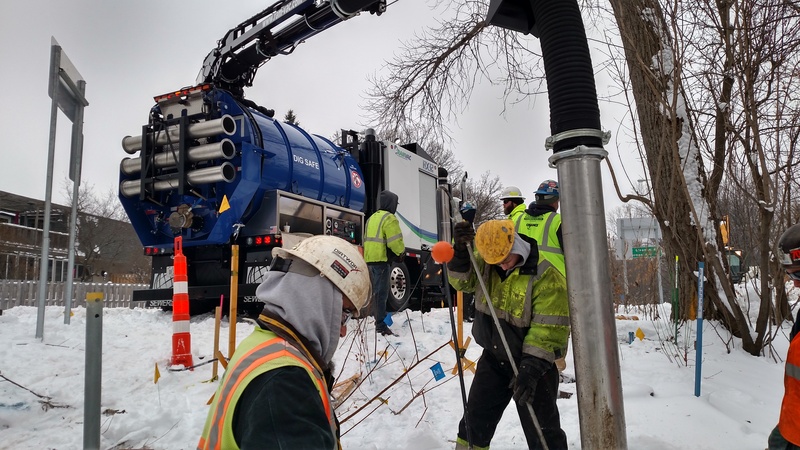 Trailer-mounted hydro excavators get the job done using an affordable and compact platform while still providing the same safe, damage-free excavation performance as truck-mounted models. Dawson offers the full series of trailer mounted hydro excavators from Ramvac, designed to meet all the needs of any operator within the industry. 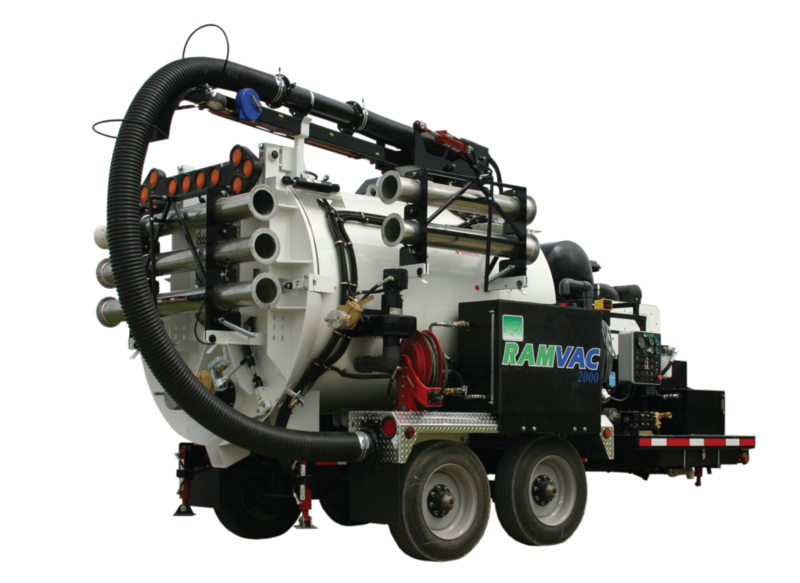 Ramvac’s three different industrial trailer-mounted vacuum excavation solutions offer extreme versatility, proven reliability, easy maintenance and cost savings. Ramvac HX series trailers alleviate your worries about hitting underground infrastructure thanks to the power of high pressure water and air movement. 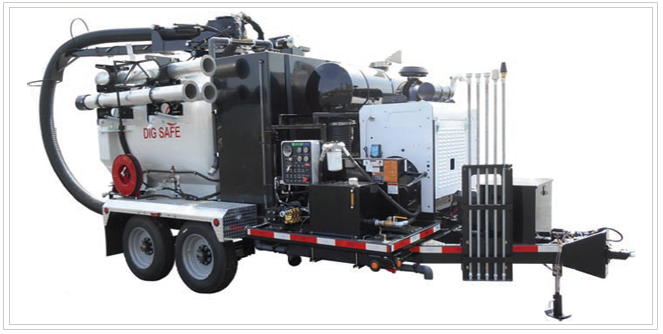 Featuring a 3 yard debris tank, 6000 gallon high pressure water system, 200,000 BTU boiler and 1400 CFM to 3000 CFM blower capacity, these hydro excavation trailers not only have big power, but also the quality and dependability required of all field work. These models are also available with a RamAir air excavation system for when you can’t risk adding water to the problem area. Contact Dawson today to configure the trailer mounted hydro excavation system that works best for you! Catch basin cleaners support a wide variety of applications, including drainage infrastructure maintenance, lift stations, water treatment plant grit chambers, pump stations, and more. Dedicated catch basin cleaners are equipped with a highly maneuverable boom and powerful vacuums allowing you to easily move from basin to basin and clean out rocks, dirt, leaves, litter and other debris that clog storm drains and curb inlets and hinder them from working properly in rainy weather. Truck and trailer mounted catch basin cleaners from Ramvac are built with this in mind. No other manufacturer in the industry puts the thought and effort into building a machine that will not only get the job done, but will remain productive for years to come. Ramvac’s catch basin cleaners help you focus stay ahead of potential problems. When those emergencies arrive, you have the right tool to complete the job. With blower capacities of 1400 CFM to 3000 CFM, 4” to 6” hose system and a 320 degree rotating boom, these machines have the power and mobility to tackle any job. Features like 3 stage cyclonic filtration to give your blower the longest life possible and NEMA 4 electrical systems to keep moisture out and down time at a minimum.